Andy Roddick couldn’t finish his second-match due to injury. MELBOURNE, Australia — Andy Roddick’s attempt to win another Grand Slam title nearly a decade after his first ended Thursday at the Australian Open when he had to retire from his second-round match due to injury. Former No. 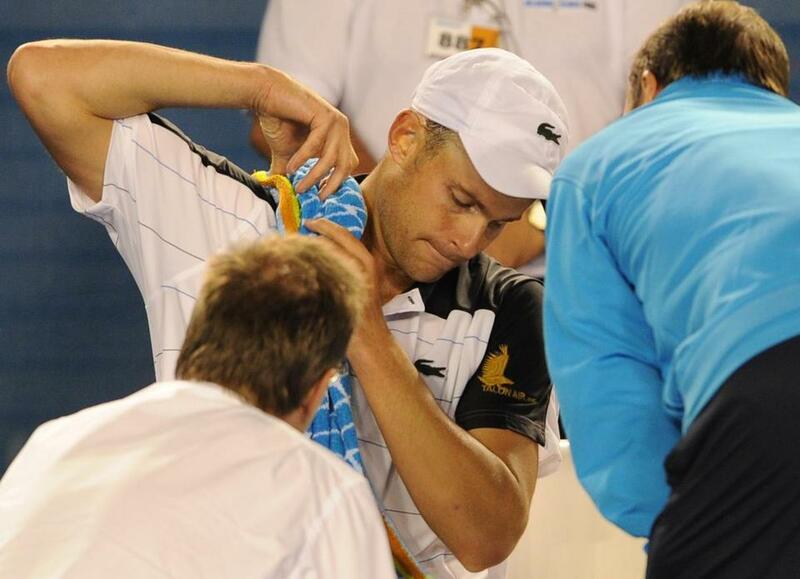 1-ranked Roddick, whose only major win came at the 2003 U.S. Open, was trailing Lleyton Hewitt 3-6, 6-3, 6-4 when he called the trainer to his courtside chair. He then walked over to Hewitt and shook the Australian player’s hand, unable to continue after sustained what appeared to be a leg injury in the opening set. Hewitt, who has won two major titles and was a finalist here in 2005, will play Canada’s Milos Raonic in the third round. A title this month would put him in select company. Only four players — Laver, Pete Sampras, Roger Federer and Rafael Nadal — have won three straight Grand Slam singles tournaments, and Djokovic could join them following his wins at last year’s Wimbledon and U.S. Open. Earlier, five-time Australian Open champion Serena Williams notched her 500th career singles victory when she beat Barbora Zahlavova Strycova 6-0, 6-4 to advance to the third round. The left ankle she badly sprained two weeks ago wasn’t an issue. ‘‘It’s totally fine. It was my good ankle, so I’m good,’’ she said. Williams won the Australian Open in 2009 and 2010, but didn’t defend her title in 2011 because she was injured. With top-seeded Caroline Wozniacki having a day off, No. 2 Petra Kvitova moved into the third round with a 6-2, 2-6, 6-4 win over Carla Suarez Navarro. Kvitova, who lost in the first round at the U.S. Open in the first major after winning Wimbledon, was down a service break in the third before recovering to beat the Spaniard. Maria Sharapova, one of the three former champions in the women’s draw, reached the third round after just two hours on court in two matches. The 2008 champion had a 6-0, 6-1 second-round win over U.S. qualifier Jamie Hampton in 64 minutes. Sharapova did not play in any warmup events and spent nearly two weeks in Melbourne ahead of the season’s first major while she rested an injured left ankle. She’ll meet No. 30 Angelique Kerber, who beat Canada’s Stephanie Dubois 7-5, 6-1. Three seeded players were beaten: No. 23 Roberta Vinci lost to China’s Zheng Jie, No. 29 Nadia Petrova fell to Sara Errani and No. 25 Kaia Kanepi lost to Ekaterina Makarova. No. 9 Janko Tipsarevic, No. 23 Milos Raonic of Canada, No. 24 Kei Nishikori of Japan and No. 27 Juan Ignacio Chela also progressed. Frenchman Michael Llodra beat No. 32 Alex Bogomolov Jr. 6-1, 6-3, 4-6, 5-7, 6-4 and Portugal’s Frederico Gil beat No. 26 Marcel Granollers in four sets.